I remember that two years ago the we were all fussing about MySpace. Then last year we were all abuzz about Facebook. And this year the big thing is Twitter. What this means for most of us is that we ought not fall in love with a particular social networking platform. I don’t know what we’ll all be talking about next year yet. But I do know that it will be something new. At this stage I have a glimmer that Google Wave might be part of the next big thing (Chris Penn‘s got some interesting thoughts on that). But I’m still waiting for my Wave beta invite so not sure on that personally. One thing is certain, those who cling to brands & platforms in this space rather than focusing on good enough functionality, community, and just enough utility will be disappointed. Sometimes the product that captures the zeitgeist is not the best product (remember VHS versus Beta?). An interesting lesson from Twitter is that not the best platform won. There were several similar competitors (e.g. Pownce or Jaiku) that had arguably better functionality. But they have fallen by the wayside. What is important for businesses & individuals is how we can ensure that moving our data – relationships, contacts, information and messages – to the next big thing is not only possible, but relatively easy. Perhaps it’s time to think about that? Yes, it is Caturday once more! Is social computing just increasing our anxiety? Since the early days of the internet revolution and web 2.0 I’ve been watching & participating in various ways. And over the past few years I’ve seen its powerful properties of network amplification working in practice. My friend and colleague Mark Pesce has recently discussed these properties in his Big Ideas talk. But with all of this I’ve also observed how the internet has amplified our anxiety as well as amplifying goodness. For example, on Twitter over the past 12 months, it has morphed from a casual communication and community platform into a sales and spruiking platform, with increasingly desperate multi level marketing or affiliate schemes. It seems to me that much of what we do as humans merely seeks to assuage anxiety, and the internet is the latest place to manifest that anxiety. So much of the activity that I see online now reeks of desperation and striving to sell, be successful and rich. But it seems that we have the opportunity to create a different kind of world with this technology and its ability to connect people beyond borders and barriers. Never before have we had technology that supports openness, collaboration and sharing on such a broad scale. We have the opportunity to use this technology to do good & creative things – like Action Aid’s Project TOTO that I’ve mentioned before, or the recent Live Local Challenge. Perhaps one way to assuage this anxiety is to use up our personal energy (and use the technology) to change the world for the better in little, local ways every day? We could choose openness over constriction, expansiveness over constraint, collaboration over competition, sustainability over wanton waste. It has been a few weeks since we did the Live Local Challenge and Rebecca and I decided to catch up for breakfast. We decided that our reunion had to incorporate local and sustainable foods. Luckily the night before I’d stayed in Camperdown after Stilgherrian’s Project TOTO farewell gathering, so the Danks Street Depot was an ideal spot for breakfast. It was lovely to have a chance to catch up with Rebecca again, and to enjoy our food while talking about life, the universe and everything. We’re both still trying to keep sustainability and living local in mind for our daily lives. It’s great to have someone to share ideas with too. Rebecca had the polenta with rhubarb and Meredith sheep’s milk yoghurt – I had a taste of this & it was scrumptious. I had the poached eggs with bacon hash, roasted tomato & sourdough toast. This was made with Cornucopia Farms Bio-dynamic Eggs from Lonstock in the upper Hunter Valley. Since I can never poach eggs properly at home, it was a delight to have such perfectly cooked ones. By the way, my new vegetable patch is going fine – although with all this rain I’ve been worried it might drown. For those who continue to think that Twitter is all about pimple faced geeks sitting alone in the dark at home tapping away on their computers here’s another real life event that shows differently. Last Saturday a bunch of us gathered to farewell our friend Stilgherrian as he takes off on a trip for Action Aid Australia to Tanzania. We gathered at Kelly’s on King Street in Newtown for a few beverages and a tasty pub meal. Sure there was some dancing, some singing along with the jukebox, and some lively debates about politics, technology, religion and philosophy. But behind it was the serious reality of Stilgherrian’s trip. Tanzania is really different and a bit more dangerous than Newtown. What’s happening here is that a well known Twitter personality & Crikey correspondent, in the form of @stilgherrian, is participating in a “groundbreaking attempt to bring the causes of poverty closer to the Australian public”. It’s a one of the many good causes we can support. Check out the Action Aid website to see the different ways you can help out. Stilgherrian takes off on his trip later this week – you can track his adventures via his blog. There’s also some more pictures from the farewell gathering on Flickr. Very soon my dear friend Stilgherrian shall embark on a big adventure in a good cause. 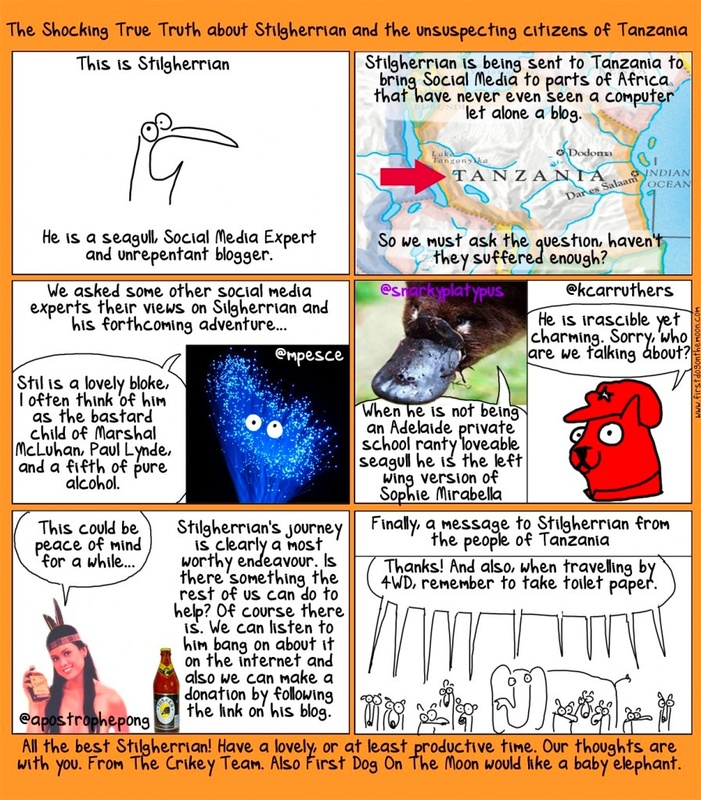 As outlined in this most excellent cartoon by the esteemed FirstDogOnMoon, Stilgherrian is going on a mission for ActionAid. Why not go have a look at the ActionAid site and see how you can get involved too? Social media and human behaviour. OMG someone who truly understands exactly how the social media world works!